Adriana Mateo debuted her new book earlier this week. The book, AM Jazz: Three Generations Under the Lens, features a collection of black and white photos of jazz artists around the world. The black and white photos, some hundred in all, are shot on the sly. The photographer is present, invisible, her camera a silent instrument. The focus is on details of what is happening inside the studio or on stage as musicians work together. "Capturing these particular moments was very special for me. I can remember each one," says Adriana. "They represent a bond I form with these artists." 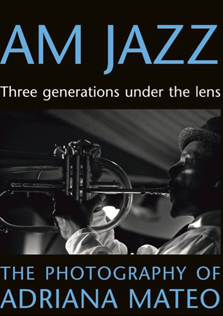 You can pick up AM Jazz: Three Generations Under the Lens HERE.